“Cut a man’s flesh and it heals… Whip a man and the memory of it passes, frighten him, fill him with a sense of foreboding and apprehension and let him believe that something dreadful is going to happen either to himself or to someone he loves – better the latter – and you will hurt him beyond forgetfulness. 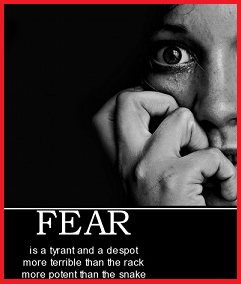 Fear is a tyrant and a despot, more terrible than the rack, more potent than the snake. Fear is many-eyed and sees horrors where normal vision only sees the ridiculous” – Edgar Wallace, British crime writer of early 20th century and creator of King Kong. “Independent India’s first divisive ruler was Indira Gandhi, to dislodge whom the entire range of opposition parties banded together in the late 1960s and 1970s. The Congress party’s success depends on dividing the so-called majority and then using scare-mongering techniques to give the minorities a stake in using their votes as vetoes in elections. This is what kept the Congress in power for so long. This divisiveness did not matter when Nehru was around, because he was a towering leader, and had natural stature and popularity after the freedom struggle. But once he was gone, Indira Gandhi found that in order to consolidate power, it was even more important to divide to conquer”. TheJaggi reprises what I had mentioned in my comment. What he writes is not a great secret that others in the media do not know. He also bluntly states that SoniaG’s foreign origin is disturbing to many in politics and outside it. She and her Congress party are most greedy for power and will do anything to stay afloat. How an EVM turned a loss for P Chidambaram to victory is still out there. How YSR Reddy looted the state of Andhra to fill his private coffers as also that of the party hasn’t unfolded fully because the media cronies never reported his corruption till Jagan Reddy was targeted for his rebellion. There is a tweet that I had put out a few days back that both ABV and LK Advani have to share some blame for excessive sympathy for the Gandhi family. After publishing a report on black money, when SoniaG complained, LKA even sent her a letter “regretting” her name being mentioned in the BJP report. I have never seen anything more stupid from the leader of an Opposition party. But below is what the SC had to say about black money. Former Army and IAS officer MG Devasayam writes: “The SC talks of the unholy nexus between lawmakers, lawkeepers and lawbreakers, clearly indicating a State-sponsored Kleptocracy runs the country”. Do read the whole article that I’ve linked. In an article at the PulitzerCenter India narrates a comic but equally tragic incident from Bihar: “There's a joke popular among local relief groups in which the state's chief minister visits a U.S. senator stateside at his palacial residence. The minister asks, "My home is so small. How do you live so well?" To which the senator responds, "See that bridge over there. Ten percent." A year later, the senator pays a visit to the Bihar minister's home, now more opulent than his. "How did you get a place like this?" he asks. "See the bridge over there..." "Which one," interrupts the senator. "One hundred percent," says the minister. This could easily be referring to Gautam Goswami, ex-district magistrate of Patna, the state capital, who along with 10 other officials was charged in 2005 with embezzling nearly $2.5 million in flood relief funds. Adding to the disgrace, Goswami was featured in Time magazine the year before as a "Young Asian Hero" for his commitment to the poor”. Err… SoniaG has been recommended by a group for the Nobel 9 times for her commitment to the poor; she was likened to Mother Teresa. Now the Kleptomanics fear a Chaiwalla because he is daring to take them on. Look at the grand alliance of the Congress: SP, JDU, BSP, SP, RJD, DMK, NCP and some more. One DMK guy was even running a private telephone exchange at his home courtesy BSNL. There is hardly any party in the alliance which doesn’t run a private kingdom. Almost each alliance partner has cases of disproportionate assets against their dictators. Extraordinary national wealth has been swindled and handed over to private hands with the Congress being the “Congotri” of the massive corruption and loot. And SoniaG has the audacity to say “power is poison” which her son comically recites and media cronies repeat like a parrot and applaud. Not one scumbag or scumbagini from the media had the courage to talk about this nonsensical statement from both the Gandhis. So unlike 1977 when many parties united against the misrule and corruption of IndiraG, this time around the entire gang of corrupt parties have united with the corrupt Congress. What is their fear? They fear losing their Kleptocracy and the country returning to some form of democracy. It threatens their “disguised dictatorship”. These guys want to run the Country or a State? No! They just want to run the “wealth” of the nation into ground by looting. Naturally, Modi responded to the cheap statement of Naresh Agarwal by stating “A Chaiwalla as PM is better than a PM who sells the country”. The sick Manish Tiwari was upset that Modi is getting too much airtime from the Congress’s crony channels. They can’t help it because it means TRP and money for them. So what does MT do? He shoots off an advisory (read threat) to the TV channels. The ministry found it to be "indecent" and "bad in taste" that news channels compared PM Manmohan Singh and BJP's PM candidate Modi over their I-Day speeches. The advisory threatened to cancel the licences of those who made such comparisons or telecast speeches. This is 2 months after the event. Why shouldn’t media and people compare? A PM who gave an I-day speech like it was a Congress event and not a national day is hardly giving a PM’s speech. Besides, the PM eulogised only Congress PMs of the past and that too only of the Nehru-Gandhi clan. In any case why should people want to listen to the most boring speaker in the history of India and that too in an age where people have moved on from these uninspiring speeches? If the PM has a right to speak, people also have the right not to hear him if they don’t want to. But hey, Kleptomaniacs don’t have such maturity because they don’t know how democracy works. (These Kleptomaniacs have the stealing disorder for both personal and party gains). Then out of the blue the EC comes up with a proposal to ban opinion polls. The EC must seriously introspect if they have over-stepped in reacting to entertainment shows in such a silly manner. But the Congress and all of their cronies support the move for obvious reasons. Poll after opinion poll is throwing eggs at their faces. It is intolerable cruelty for them. For SoniaG these acts to muzzle the media is not an “attack on democracy”. Pappu won’t come out screaming it’s “complete nonsense”. After all, these bans are to protect and preserve their Kleptocracy. I consider the MSM possessing a lot of morons, including one at the highest level of Category5, but I would never want these morons to be gagged no matter what. Our Constitution provides them the complete freedom for their moronery. But perhaps SoniaG may be “unhappy” so the threats of bans. As if she hasn’t already turned this into a “Ban-anee” republic. Ask the “legalised” son! 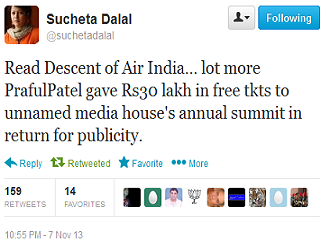 Here’s a tweet by Sucheta Dalal of Moneylife. She mentions how AirIndia was being looted by the Kleptomaniacs. 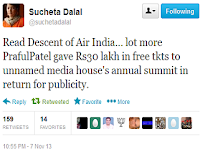 Giving out free tickets to media houses for their annual summit? What is so surprising about the media mafia? Let me refresh your memory. It’s not just AirIndia but many PSUs that have been misused to dole out funds to private parties of media houses (read this about HT Summit). One of the biggest building contractors of the GOI, GMR Group, doles out sponsorship for CNN-IBN’s spurious IOTY awards. The less said about Tehelka’s THINK the better. Oh and if all that is not enough there’s Nandan Nilekani. The Aadhar champion is a classic case of nepotism, which is the twin sister of Kleptocracy (and you thought Vadra was the only one?). Nilekani is a member of seventeen GOI groups, govt bodies, committees and boards that made Aadhar mandatory for govt benefits. I start a joke and I also hold the power to make it mandatory for you to laugh. Power! This Kleptocracy is fun, isn’t it? The populist pursuits of the Congis and “sickulars” is now getting to be very predictable. There isn’t even any innovation or creativity in their skulduggery. 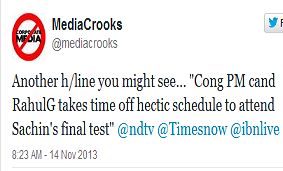 I predicted RahulG will land up at Wankhede to watch Sachin Tendulkar’s last Test Match. He would have hoped the popularity and emotions behind Sachin’s event will garner him some more sympathy. You know, we could learn to hate the truth like the Congis and many of our MSM crooks do. Yesterday in Delhi Sheila Dikshit had to plead with women not to leave as RahulG was about to speak. From Chaiwallas to Polishwallas to villagers, Indians don’t have patience with hollow nonsense anymore. They are not willing to be pushed to fear anymore. It’s the Kleptomaniacs who are cowering in fear. Truth has this nasty habit of showing up at the wrong time and exposing everything in a very non-subtle fashion. People aren’t fooled anymore as RahulG realised when the crowds greeted him (Video 0.28 secs). Not a good sign for Kleptomaniacs. 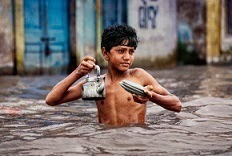 I saw the photo above of that little Chaiwala boy. While himself deep into the trouble, trying his best to keep his responsibilities away from it. Eyes focused on the the destination; and his body language oozing the confidence of reaching his goal. I imagined, one day he will rise; and rise to change the fate of that vast land of billion plus people, for good; where he is a nobody today. My reference is to the last para about the crowd at Pappu's rallies dispersing while he took to the mike.It is quite clear that these crowds are not passionate followers of the dynasty but paid, to be at the venue for a certain number of hours. It is reported that Paapu arrived 3 hrs behind schedule.So they were just dispersing after their office hours.As NaMo says so often ,one must turn tragedies into opportunities. Why not BJP cadres accept khanChris black money and join in large numbers at pappu's rallies and then vacate the site when he arrives. This would be a double edged weapon.It is another matter that as of now KhanChris is on the way down on its own weight. I have already sait that... Crowd in Pappu's rallies is comprised of #Daruchchas .. 1 KHAMBA and 500 Ka note and Transportation fascility plus Bidi/ Cigarette etc.. I don't know which Cadre you referring to but i don't think anybody got time to attend pappu's rally. People attended NaMo rally coz they really wanted to hear him. Atleast this is what I've seen and known about his rallies..!! Another wonderful article from your pen...crisp, upright, brave analysis.....cannot believe there are still journalists like you, Tavleen & Minhaz. Why dint you join the BD,RS,SG club and enjoy life? NaMo is another guy spending himself for the stupid, selfish people who vote congress to power election after election. 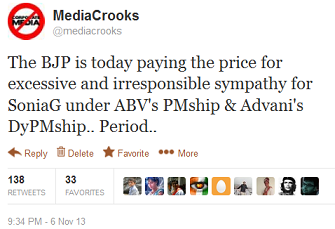 NaMo too could have been like Mayawati & Mulayam...would have been rich and there would have been no witch-hunt. Some guys just have this death-wish for the sake of motherland...they don't realize that the 'liberal, secular' brigade made patriotism old-fashioned long way back. "A PM who gave an I-day speech like it was a Congress event and not a national day is hardly giving a PM’s speech. Besides, the PM eulogized only Congress PMs of the past and that too only of the Nehru-Gandhi clan. " "If the President of the USA were to read the Declaration of Independence at the Lincoln Memorial on a 4th of July; there would be 'someone' to protest against it"
India needs the "CHAIWALA " desperately & ASAP. I am referring to your point 4..I am now about 55 and have been voting BJP ever since I got the voting right. Irrespective of many a times differing on some issues. With my vote only NDA government came to power, only once. But you can understand the frustration a person gets when his vote does't matter at all. I am of the opinion that after the Ayodhya movement, there was a golden opportunity to further your ideological debate and gain popular imagination which was lost due to the projection of Vajpayee as a statesman and inclusive leader. I also feel in those days BJP was not ready with it's economical ideology and debate which NaMo has brought in focus. Even though I appreciate Vajpaeyee's tenure of NDA , I see that BJP lost on a larger debate of Congress's policies of minority appeasement and economic policies was lost. It was further lost because middle class in 2004 thought that Maun Mohan Singh is a true reformer. Actually the credit for his reform polices should go to Narsimha Rao. He is just a puppet bureaucrat and a spineless person whose mouth opens only to criticize BJP on the orders of the dynasty. I also feel that in the days of NDA even though their handling of economy was good, they could not project it as an ideological achievement and debate on the left leaning economic policies of distributing poverty rather than creating wealth in last 60 years. Today, all the criticism on NaMo's Economic Policies or his secularism is from this lobby of leftists/seculars/Congress ruling us from independence. I am happy that NaMo has courage and wisdom to take on them head on. Now it is our responsibility to back him to the hilt. Thanks to NaMo all these things have come on Agenda again. He bluntly asks Congress that you people are ruling 60 years of Independent India how much more time do you need to offer us prosperity. That exactly is the question to be asked, which BJP failed to ask last 10 years under LK Advani (stupid Jinnha episode written by Sudheendra Kulkarni a known leftist in BJP), Sushma Swaraj, Arun Jaitley. "This is called committed vote bank, for instance, in Old city of Hyderabad, where Muslims are in majority, Hindus continue to vote for BJP, even if it loses, pronouncing the unacceptable politics of MIM(the guys who want to exterminate Hindus if police stay away)." I have myself done the above while I was staying in the Old city of Hyderabad. Actually this the greatest strength of Ravinar... He has taught us (atleast me) argue only on facts and he has poured facts by buckets over the years... With the facts on your side you'll just see the other party struggling for arguements.. let me state an example.. I was chatting with one of my colleague and discussing Modi...he started of saying that he is anti minority and the best example is that he refuses to wear the skull cap. I tried him to convince him with vote bank politics logic but that didn't work. Then I applied Ravi's formula.. show facts .... I told him yes he is anti minority because even the state roads in Gujarat (I am from Baroda...) is better than national highways.. the underground water levels have come up in many places, animals are insured , farmers have soil health cards, solar electricity is growing by day, 24X7 electricity...and many more and none of this is being used by minorities as he does not wear the skull cap... After this the discourse changed and all he had was modi has left his wife... I could not convince him to admit he was wrong but when his arguments boiled down to Modi's wife then you know you won!! That's the power of statinf facts. Thanks Ravi for arming many people like me with this tool/weapon. You do need to keep your observations in a single comment and as crisp as possible. I'm saying this because people generally tend not to read long, lengthy comments... Nothing against multiple comments but a request to keep it crisp..
Ravinar, You can delete all my posts in few days. I have been only trying to find solution to my last question about "why fooling Muslims is necessary and important for Secular parties? "- Thanks in Advance. Vamsi, your observations are correct and all should read them.....more and more people are now revolting against 'political-correctness' and developing courage for their convictions. Excellent article Ravinar. You take good care of your safety and keep exposing the MSM. Have agents of the Cong(I) not yet approached you to buy you out? Just a thought. Indian journalism is going backward and not forward, they dont show news they just give opinions, i dont know how long it is going to take the Indian MSM to make documentaries like the ones from BBC and AL Jazeera. I think media crooks should take over the job and make some nice documentaries as well. Also i would have never known about tonny benn, if not from here, Thanks. Please do keep writing even if UPA comes to power again, you never know, with this kind of democracy. Would be obliged if u could share the list of movies to watch and books to read in your blog as well. he he.. ok!! Have u read it ? Is it different from what it is written here? let me know, if it is different i will order it. I ordered it on day one when it came out for order. It was mainly to support such a nice writings. Regarding book: This book has very good categorisation of his (selected) blogs and introduction to each category. 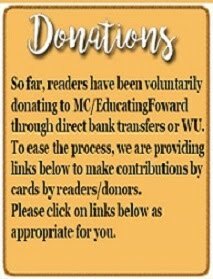 With list of recommended books/blogs/movies in the end. Unfortunately the person who is reading this blog, is already aware of the #CorruptCongress misrule, he knows the difference between appeasement and development. If this blog can reach to the Aam Aadmi via SMS, MMS, pamphlets, mp3, or any possible way, thats when the junta start realising the truth. Most reached to this blog either via Facebook or Twitter, isn't it? We had access to FB/Twitter. How to make this content reachable to people who don t know whats Facebook or Twitter; the common man or internet unfriendly or uneducated or a person who doesn't have time to read through the post. 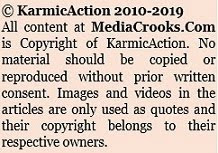 Hello people I have some comments and questions to make about latest sting tapes released by Ashish Khaitan, I thought this is perfect forum to post about where people exposes MediaCrooks. 1. Latest tapes were about Pradeep Sharma and Kuldeep Sharma, where Guj govt was trying to track their corruption then why congress and media is trying to portray it against only that girl. 1. Who is Kuldeep, which is there in tape around 10:30 ?? For your information Pradeep Sharma's brother name is Kuldeep Sharma who is IPS officer. Both of these Sharma brothers known to be Modi baiter. By the way Kuldeep Sharma was suspended from guj police as well, now works for center congress govt agency. 3. According to many media people, Congress and CBI since last 10 yrs, Vanzara was killing all in fake encounters on behest of Amit shah and Modi......if so then why would Amit Shah get Vanzara in the jail, according to tapes at around 11:00?? UPA regime is mulling a new scheme “Rajiv Gandhi Rahul Gandhi Bhashan Suno Yojana”, under which anyone who can sit through five minutes of Rahul Gandhi’s speech will be given Rs. 500 rupees and a voucher to have biryani at any restaurant of their choice. “It is a brilliant scheme that admirably combines the twin goals of poverty alleviation with Gandhi family marketing. I will not be surprised if they bring one such law. Hope they give free ear plugs too with the money and biryani! One more killer. Great going Ravi. One of the best things about reading your blog is like someone standing in the front and delivering the speech. Can't Thank You enough for all the hard work.
' both ABV and LK Advani have to share some blame for excessive sympathy for the Gandhi family' - this is cent percent correct. Actually ABV and LKA were representing the first generation people of independence who would blindly follow and adore Nehru. They could not think beyond Nehru. But time has changed. Now new generation is not afraid of thinking beyond Nehru family. In fact they realised until and unless get rid of the burden of Nehru `legacy' this country will not develop. That is why they are backing Modi who is representing their thoughts. Ravi - words fail to praise you and you make us fail everytime - pls accept my humble "great job". When NDA was in power, ABV should have taken Khanchris to task, starting with independence of temples from government control. Apart from focusing on Economy and nation building, BJP should have played it smart and taken First Family to cleaners because without them this Khanchris loses the mascot. Aadhaar can be a great idea if implemented properly. I am curious to know about the negatives of aadhaar that cannot be overcome with time. Aadhar can never be a great idea...!!! You cannot give your privacy to state. Tomorrow, banks implement retina and finger print scanner for your lockers and state would be authorized to open your account without your consent. No country collects finger prints data..!! Everything would be tracked. Although i agree that ABV & LKA could have acted against Nehru clan but that simply gives them chance to play victim aClassic example is Indira Gandhi's after after emergency. These fools must be ignored at best. Like namo did in case of media. They will self explode if kept out of power. Well, I read that article in HT. If at all such a bill or ordinance is passed would be quite detrimental to the Private sector. However, I have this suggestion to make to Pvt. sector HR / Management. In the event of such laws passed by Congis, the best way to circumvent it is - DON'T ADVERTISE your vacancies. Fill the vacancies through in house contacts or your own network. I guess, that would beat them in their own game - as there is no evidence of job vacancies in the first place.